The novel is an ironic take on the traditional Icelandic mini-celebrity biography, a genre that was very popular at the time. Ragga Birna is a “famous” actress and musician who remembers her life in the most positive light. Her life is full of failures, but she meets all of them with the self-delusional phrase “Things are going great!”. She goes from the piano to violin, from violin to viola, from viola to singing, from singing to acting, from acting to movie-acting, from movie-acting to bad movie-acting. The reader slowly learns that this woman has never had any talent for any art in her life. Yet her whole being has been committed to fulfil her dream of “making it” as an artist. The character of Ragga Birna and her tragic life story was based on Helgason’s impressions of the artistic life in Iceland and the States during the seventies and eighties, and makes good fun of the big eighties idea of “making it”. Indeed, the book makes fun of almost every aspect of artistic life in Iceland in the years from Ragga’s birth in 1959 until she finally reaches her “stardom” in 1994, when she is paralysed from waist down in an accident on the set of a no-budget Icelandic Viking movie and ends up on the front page in a wheelchair, all smiling and happy with her long overdue fame. 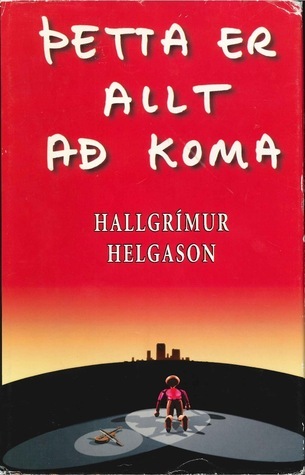 The book became a local hit and a theatre version was put on stage at the National Theatre of Iceland in 2004, directed by Baltasar Kormákur. It won the Gríman prize (the Icelandic Tonys’) for best play of the year.